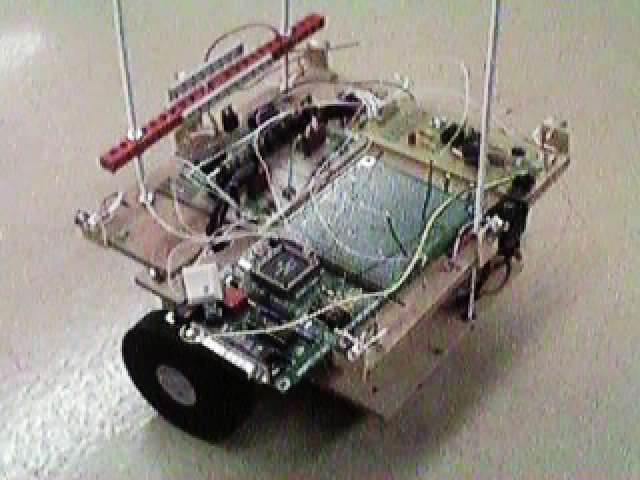 This paper describes the design and construction of a small autonomous robot for entry in the 1998 Fire Fighting Robot Competition. At the heart of the system is the 68HC12 microcontroller by Motorola. Program code to control the fire fighting robot is written in 68HC12 native assembly language. The system controls two optically isolated stepper motors for precision movement. Furthermore, the robot performs analog to digital conversion on 6 infrared sensors: 4 for wall proximity detection, one to detect floor markings, and one for candle detection. The 4 proximity sensors utilize heterodyne modulation of the IR signals to reduce the effects of ambient lighting. The extinguishing system is comprised of a large fan salvaged from a toy hovercraft, and a 3.5kHz tone decoder circuit is used to start the robot and gain bonus points. The annual Fire Fighting Robot Competition sponsored by Trinity College has been an exciting event for several years. Robot hobbyists and professionals of all ages from all parts of the world gather to compete and show off their creations. The goal of the event seems simple: Navigate a model house floorplan, find a lit candle, and extinguish it. As simple as this may sound, it is an intricate process to construct a device which can accomplish such a task. There are a vast number of design options and operating techniques that can be explored. As the contest�s web page states, a primary purpose of the contest is to "provide an incentive for the robotics community to develop what will be a practical application for a real-world robot". Although the contest is merely a simulation of a real-world scenario, it requires the designers to use practical techniques to create useful designs. The competition serves as an example of what robots can do on a larger scale. In the first year of competition, there were only a few robots that were able to successfully find and extinguish the candle reliably. The more recent events, however, have yielded a larger number of successful entries. It appears, that the designs are becoming more sound as the robotics community learns which approaches work and which fail. Because of these improvements, the event has a higher level of competition. An entry that strives to perform well must be fast and reliable. This designers of this project aim to accomplish both these tasks. Although the rules of the contest are lengthy and detailed, an overview will be given to provide a better understanding of the design approach used in this project. See the Rules Page (Appendix B) on the Trinity College web page for the full list of contest rules. The maximum size of the robot is 12.5" x 12.5" x 12.5". The robot must be completely autonomous and human control or intervention of any kind is not allowed. The floorplan is a fixed layout (See Appendix A). The walls are white and the floors are black. A white circle 12" in diameter will be placed on the floor surrounding the candle. The bottom of the candle flame will be between 6 and 8 inches from the floor. The candle will be placed in a room and not in a hallways. Scoring is based on the time taken to find and extinguish the candle. Lower times are considered higher scores. A 5% reduction in time will be given if the robot begins its trial by detecting a 3.5kHz tone. A 10% reduction in time will be given if the robot is able to navigate back to the starting point. A 10% reduction in time will be given if the robot is successful in finding and extinguishing the candle in 3 consecutive trials. A 5 second penalty will be applied each time the robot touches a wall. A 50 second penalty will be applied if the robot touches the candle. Figure 1 is a functional block diagram of the robot system. At the heart of the robot is the 68HC12 microcontroller from Motorolla. The microcontroller is responsible for sending signals to and receiving signals from the robot hardware. First, the 68HC12 receives input from the calibration button before each run. This allows the user to align the robot at a specific distance from the desired wall to be followed. Once this has occured, the 68HC12 waits for a logic low from the tone-decoder. Then, the controller outputs to the optoisolators to control the motor driver circuits. The controller also reads values from the IR phototransistors in order to detect walls and search for the candle. When deciding how to move the robot through the house, the designers realized that precision movement would be necessary in order to avoid touching the walls and receiving penalties. In order to achieve the required precision in movement, it was decided that the robot would utilize stepper motors. The main benefit of stepper motors is that they are able to turn a specific number of degrees for every step. A four phase stepper motor has four coils that, when energized in a specific sequence, rotate a driving magnetic field which, consequently, rotates a set of permanent magnets. These permanent magnets are attached to a rotor which drives an output shaft. Thus, by pulsing the coils in a certain sequence, a clockwise or counterclockwise movement can be attained. A change in the coil states (ie. changing from state 2 to state 3 as shown above) results in a single step of the motor shaft. Direction is easily controlled by running through the above sequence either forward or backward. It should also be noted that the coils A and A' are always oppositely charged, as are coils B and B'. By inverting the signals going to coils A and B, the corresponding signals A' and B' can be attained. Thus, only two control lines are required to place the motor into any one of the 4 possible states. Even though this is an important consideration for certain applications, the controller used in this implementation has a sufficient number of lines to control each coil. Furthermore, because two of the coils are always energized at any given time, the rotor is held into place by the two magnetic fields and hence will not easily slip -- even when the motor is not turning. This is another benefit of stepper motors. Figure 2 provides an internal diagram of a typical four phase stepper motor. The stepper motors used for this project were salvaged from surplus Epson printers. The steppers are designed to provide 1.8 degrees per step (or 200 steps per revolution) and supply a sufficient amount of torque. However, the current requirements of almost any motor are more than a digital output can provide. Because of this requirement, a transistor circuit is needed to drive the motor coils. The circuit shown in Figure 3 is used to drive the motor coils. Because there are a total of eight motor coils in the robot, eight of these circuits are needed. The circuit functions by receiving a digital input from the microcontroller. This signal is fed to an optoisolator in order to separate the low-voltage, low-current microcontroller from potentially dangerous signals in the motor driver circuit. In other words, the optoisolator allows the 68HC12 to control the motors without any physical connection to the driver circuit. The output side of the optoisolator then drives the base of the TIP112 driver transistor. Just as the stepper motors were, the TIP112 transistors were salvaged from the Epson printers. The TIP112 power transistors are able to supply 50 watts of power, which is more than sufficient to drive the stepper motor coils. When the microcontroller outputs a digital low signal (logic 0), the output side of the optoisolator acts as an open circuit (ie. no current flows into the collector). The remaining current path is then from Vcc through the pull-up resistor and into the base of the TIP112 driver transistor. This effectively turns the transistor on so that current can flow from collector to emitter. Clearly, current will flow from the 7.2V battery, through the motor coil, into the collector of the TIP112, and to the emitter ground. Hence, when a logic 0 is sent from the 68HC12 to a given driver circuit, the corresponding coil will become energized. Inversely, when the microcontroller outputs a digital high signal (logic 1), current will flow from collector to emitter in the output of the optoisolator. This will restrict current from flowing into the base of the driver transistor -- causing it to be turned "off". When the driver transistor is "off", there is no path to ground and thus the coil will not be energized. The current dissipating diode (or "free-wheeling diode") D1 is used so that the current stored in the motor coil does not damage the power transistor. When the transistor is turned off, the large magnetic field stored in the motor coil could generate a current spike through the collector to ground. The diode, however, will allow this potentially dangerous current to flow around the motor coil until it has been dissipated. The diode also helps to reduce the time it takes for the motor coil to switch from an "on" state to an "off" state. The speed at which a stepper motor can reliably rotate is relative to the amount of time it takes for a motor coil to switch states. By reducing the transition time, the stepper motor can be driven at higher frequencies resulting in a higher velocity. A small resistor in series with diode D1 has also been added to help reduce the transition time of the motor coil. As one can see, the stepper motors give a wonderful amount of resolution in terms of distance. 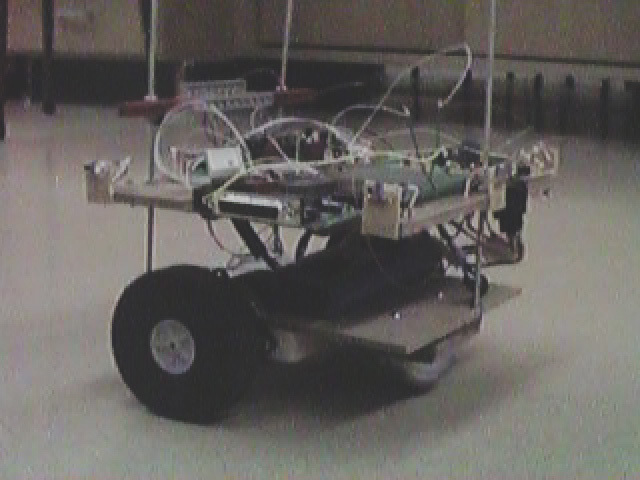 Additionally, a test was performed to determine how long both steppers could be driven before the supply battery would fail to move the robot. With a freshly charged 7.2V battery pack, the steppers pulled a total of 4.4A. This current draw, naturally, was reduced as the battery voltage drained. After 27 minutes of constant movement under full robot load, the steppers eventually failed to provide enough torque to move the robot. Prior to stopping, the stepper motors were drawing 3.2A. Although the steppers draw a serious amount of current from the battery, the test proves that the robot should be able to navigate the model house three times on a single freshly-charged battery. In order for the robot to determine its position in the house, some kind of proximity sensing device is needed. After some consideration, an infrared system was chosen for its simplicity. Other types of sensors (specifically ultrasonic) do give higher degrees of accuracy when measuring distance; however, infrared remains a simple and sufficient solution at a lower price tag. Additionally, the infrared sensing devices are available locally. Infrared phototransistors function by using light to stimulate the electrons in the base of a transistor. Simply put, when light falls onto the device, the transistor becomes "closed" and current is allowed to flow from collector to emitter. Similarly, when the device is in complete darkness, the transistor is "open" and the collector current is zero. The amount of collector current is directly related to the amount of light on the device. Because the infrared component of ambient light (or normal room light) may change depending on several uncontrollable environmental factors, the ambient light alone cannot be used for proximity sensing. Rather, an infrared light emitting diode (IR LED) is used to provide a more usable level of IR to the phototransistor. When the IR LED is forward biased, IR light will emit out of the device and reflect off the white walls back to the phototransistor. Because light intensity falls off as a function of distance, the amount of IR sensed by the transistor is directly related to the distance to the reflecting surface. All transistors, however, have a limited operating region. Specifically, a phototransistor's collector to emitter voltage will only vary within a certain range of light intensities. To prove that the IR sensors would be sufficient for proximity detection, a series of tests were performed and measurements were recorded. In each test, a phototransistor was biased with a different collector resistor to determine an adequate resistance value. The results of the tests were graphed as transistor voltage as a function of wall distance. Figure 4 shows these results. The project nature requires that the sensors have good resolution at relatively close ranges. Although the 10k and 20k Ohm resistors gave a smooth range of values between 3 and approximately 16 inches, it was decided that a low-range cut-off of 3 inches would not suffice. The 5k Ohm resistor performed better in that it gave a lower cut-off point of approximately 2 inches, while the 1k Ohm resistor failed to detect the wall at approximately 5 inches. The measurements show that a 3k Ohm resistor provides the perfect bias: A moderately smooth change in transistor voltage occur between 1.5 and 8 inches. Because the critical robot movements occur in the 18 inch-wide hallways and the robot is 12 inches wide, the side sensors will be able to accurately determine the distance to each wall. It should be noted, though, that the above graph reflects sensor measurements taken with a small flashlight illuminating the wall surface. Because a flashlight bulb can provide a large amount of IR, it was the first choice for the infrared source. It was later discovered that the flashlight bulbs would be a poor choice for two reasons. First, the bulbs have a slow on-off time, so slow that it is visible to the human eye. With the large number of sensor readings that the robot must make, the slow switching becomes intolerable. Second, the bulbs draw far too much current at approximately 1A per bulb. With 7 bulbs (one for each corresponding sensor), the current drain would become too much for a small mobile robot of this kind. The solution was to repeat the above process using IR LEDs instead of flashlight bulbs, take measurements, and produce a similar graph. From this graph, the designers were able to determine that a 15k bias resistor would be needed to work well with the IR LED. Because the LEDs emit far less IR light than the flashlight bulbs, the phototransistors must be biased differently. Initially, a simple proximity sensing solution was implemented using a IR LED and phototransistor pair. This method was adequate, but performed rather poorly when subjected to differing ambient light conditions. It was decided that an improved solution must be constructed. In order to cancel out the effects of ambient light, a form of heterodyne modulation of the IR signal is used. Figure 5 shows the demodulation circuit. The circuit theory is straightforward. The 68HC12 uses one of the built-in pulse-width modulation (PWM) channels to strobe the base of a TIP112 power transistor and flash an IR LED at a frequency of 1kHz. The signal received at the phototransistor will be comprised primarily of a DC level (from ambient light), a 120Hz signal (from standard room lights), and the 1kHz signal emitted by the IR LEDs. The idea then is to filter out the unwanted signals and obtain only the 1kHz "carrier". The intensity of the 1kHz signal can then be used to give an accurate indication of how far the robot is from a certain wall in the house. A 741 operational amplifier is used to create a bandpass filter for phototransistor signal. This circuit was designed around a high-pass filter from the AARL handbook. By adding a capacitor in the positive feedback path, the lower frequencies can be restricted. The result is a bandpass filter. The output of the bandpass filter is the recovered 1kHz signal. However, this signal cannot be read directly by the analog to digital converter on the 68HC12 because it swings to negative voltages. To make this signal useful, the signal must be converted to a relative DC level (or intensity level). In order to do this, the output of the 741 is passed through a diode that acts as a half-wave recitifier. The result is a waveform comprised of only positive levels. This signal is then passed over a 47uF capacitor to ground in order to smooth the signal to a near-DC level. The 10k parallel resistor provides a current path for the voltage stored in the capacitor, so that the voltage can change rapidly. Because the filter may output signals greater than 5V, a 5V zener diode is used to clip the output at 5V. By connecting the analog to digital input of the 68HC12 to the output of the filter, an accurate measurement of a wall distance can be obtained. Most importantly, the measurement will not be influenced by the amount of ambient light in the house. As stated previously, there are 4 sensor channels that utilize the above-described modulation/demodulation technique. These correspond to the right, left, front, and back wall sensors. The floor sensor, however, need only be capable of determining if a white line is present. In other words, the floor sensor measurement is converted to a binary value (present, not present), and therefore modulation is not necessary. The candle detection circuit also implements a phototransistor. However, because a candle emits a substantially large amount of IR, an IR emitter is not required. When the phototransistor is directly pointed at a lit candle, the collector to emitter voltage drops approximately 1.7V at a distance of 24 inches. Even at a distance of 3 feet, there is a significant drop in voltage to be detected by the microcontroller's A/D and to indicate the presence and direction of the candle. These specifications are within the requirements of the project. To further improve the directionality of the candle sensor and to improve its distance threshold, a reflective parabolic dish was placed around the candle sensor. By using a simple phototransistor for candle detection, the robot will be able to determine if the candle is present from the doorway of any room. The circuit is based around two integrated circuits: An LM385 audio amplifier and the LM567 tone decoder IC. The LM385 is used to amplify the weak signal picked up by the condenser microphone, and the LM567 is used to filter the signal and provide a logic low when the signal is present. An audio signal is picked up by a small condenser microphone and fed to the input of the audio amplifier. The LM385 is useful in that it requires only a single positive supply voltage, unlike most similar amplifiers. This reduces the need for an additional power supply -- a serious consideration for a small robot. The LM385 is designed to give a typical gain of 20, but the use of feedback may increase the gain to more than 100. The potentiometer between the output pin and the negative input pin supplies this feedback and allows the circuit to be adjusted. For this circuit, Rt is comprised of a fixed 5k resistor and a potentiometer so that the frequency of operation can be adjusted, or the circuit can be tuned. After the circuit was constructed and tuned to a relatively low volume input signal, several measurements were recorded. These measurements show the gain of the amplifier to be approximately 60, and the bandwidth of the tone decoder to be approximately 500Hz (or 14.3% of the operating frequency). As indicated previously, 6 channels of analog to digital conversion are being used to perform sensor readings. The improved clock speed (compared to the 68HC11 predecessor) will allow more computations per second, resulting in improved navigation control. The Flash EEPROM can allow larger and more complex programs to be written. Unfortunately, the Flash EEPROM array on the 68HC12 chip can only be reprogrammed 100 times. This is a serious limitation when designing, testing, and debugging program code. Because of this limitation, the project designers have attempted to keep the code simple so that it can fit into the 768 bytes of byte-erasable EEPROM. The byte-erasable EEPROM is more useful in that it can be reprogrammed 10,000 times. Ideally, as reliable and stable sections of the robot control code are completed, they could be programmed into the Flash EEPROM and used at a later time. However, the default programming utility (D-Bug 12) that allows programming of the byte-erasable EEPROM resides in the Flash EEPROM. Any programming to the Flash EEPROM array will remove the important debugging utility and make code development much more difficult. Ideally, a smaller programming utility could be developed to replace D-Bug12 and coexist in Flash EEPROM with other robot functions. Program code to control the robot is written in the 68HC12's native assembly language. Another nice feature is that 68HC11 code can be compiled and executed on the 68HC12. See Appendix C for a listing of the current source code. Because the floorplan is fixed and the placement of the candle can be considered random, the robot can be programmed to traverse the house in a specific room order. The entire program operation is straightforward: Wait for the tone, then proceed to first room, if candle is present, locate and extinguish it, otherwise proceed to the next room. Once the candle has been successfully extinguished, the robot will return to the starting location for a bonus reduction in time. Figure 7 shows a program flowchart for this operation. In order for the robot to accomplish the above tasks, it must first navigate through the hallways in order to find a room. Ideally, the robot must be able to find its way into a given room from any location in the house. Figure 8 demonstrates how this is to be accomplished. Simply put, the robot is able to follow a given wall by comparing sensor readings with the calibration readings. If the robot determines that it is too close to the specified wall, it sets the motor directions and turns away from the wall. Similarly, if the robot is too far from a wall, it will set the motor directions and turn toward the wall. Although this may seem like a poor control method, the small steps of the stepper motors provide a seemingly fluid robot movement. A relatively simple means of navigating the entire house, then, is to simply follow a given wall until a room has been entered. As mentioned before, this condition can be detected when the floor sensor picks up the white line marking the room doorway. Once the robot has found its way into a room, it must then determine if the candle is present. As stated previously, the sensors should be capable of locating the candle from the doorway of any given room. To ensure that the robot can scan the entire room contents, it first attempts to drive 12 inches into the room. If it encounters the circle surrounding the candle or travels all 12 inches, it will begin a counterclockwise sweep to "look" for the candle. If the candle is present in the given room, the robot will move toward it (if it is not already close enough) and blow it out. Figure 9 demonstrates the Room subroutine and how the robot behaves once it has entered a room. It should also be noted that if the candle has already been extinguished, the robot will simply stop at the doorway and back up to the facing wall. Once the robot has processed all four rooms, it can then realign with a wall and follow that wall back to the starting point. Again, during the return trip, the robot does not enter the rooms looking for the candle. By performing the tasks listed in the above three flowcharts, the robot is able to enter the house, locate the candle, extinguish it, and navigate back to the beginning. A series of tests were perfomed on the robot to see how it would perform with the candle in various locations in the house. 24 fixed candle locations were chosen and a series of 24 trials were conducted. Out of the 24 trials, the robot was able to successfully extinguish the candle 21 times. At the time of the trials, program code was still under development, and thus the robot only completed its return (without touching any of the walls) on 13 of the 21 attempts. The time taken for the robot to reach the candle and extinguish it ranged from 14 seconds in the first room to 49 seconds in the fourth room. With a 55% reduction in time, the worst case scenerio would be approximately 27 seconds per trial. These results demonstrate that the robot can accomplish all desired tasks while performing reliably. The annual fire fighting robot competition is an interesting event that challenges the contestants to design a small robot that is capable of finding and extinguishing a lit candle. A solid and reliable design for this competition has been constructed and tested with promising results. The two-wheel design allows the robot precision movement by using stepper motors while also keeping control simple. Proximity sensing is accomplished though the use of IR phototransistors. The devices work well in allowing the robot to determine how far it is from the walls in any given direction up to a distance of approximatley 6 inches. By modulating the IR emitters and passing the phototransistor output through a bandpass filter, the effects of ambient light can be greatly reduced. The two rechargable batteries (for the motors and logic circuits, respectively) have been tested under full load and are capable of supplying the robot with enough power to complete all three of its trials. By using a tone decoder to begin its trials, the robot will receive a 5% reduction in overall time. Furthermore, the program code written for the 68HC12 microcontroller is capable of moving the robot through the model house without touching any walls. It can enter each of the rooms, scan for the lit candle, and extinguish it if it is present. Once is has navigated the entire house and put out the candle, the robot will the navigate back to the starting position. At this point in time, though, the primary task left to be completed is continued development of program code. In certain portions of the house, the robot does not move efficiently (that is, it comes quite close to hitting the walls). As the program code improves, though, the robots performance improves. The existing code (see Appendix C) does, however, successfully accomplish all necessary tasks for competition. The existing robot chassis has evolved from an early prototype. Although the existing chassis serves its basic purpose of supporting the necessary hardware, the design can be improved. An improved chassis design could be lighter to create less torque on the stepper motors. This should result in a faster maximum speed and/or a longer battery usability. Also, an improved chassis could allow better placement of the circuitboards and wiring that is less disorderly. By developing software to write programs into the byte-erasable EEPROM on the 68HC12, the authors could more effectively utilize the available memory. This would allow the D-Bug12 software to be replaced and would free up most of the flash EEPROM space for additional code development. The software listed in Appendix C nearly fills the entire array of byte-erasable memory, and this has become a serious limitation. With more code space available, the robot would be able to perform more rigorous computations on the incoming sensor data. Specifically, a more stable control method could be implemented. Benjamin C. Kuo, Step Motors and Control Systems, SRL Publishing Company, Champagne, IL, 1979. Parallax, Inc, Basic Stamp Manual, version 1.8, Parallax, Inc. 1997. The full list of contest rules can be located at the Trinity College Fire Fighting Robot 1998 Contest Rules page. The following is a complete listing of the most recent version of the program code used to control the robot. The program comments in the header describe the robots behavior with this code. ; reaches the circle it will turn the fan on and blow out the candle. ; it will just sit there. ; 3/31 - This is the reduced code with modulation added in. ;that way, they aren't lost when we power down.